Why does the West rule? 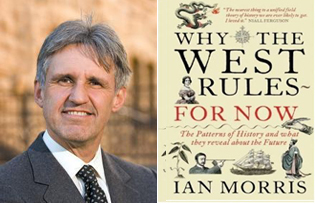 Ian Morris answers this provocative question, drawing uniquely on 20,000 years of history and archaeology, and the methods of social science. Why did British boats shoot their way up the Yangzi in 1842, rather than Chinese ones up the Thames? Why do Easterners use English more than Europeans speak in Mandarin or Japanese? To put it bluntly, why does the West rule? There are two schools of thought: the ‘Long-Term Lock In’ theory, suggesting some sort of inevitability, and the ‘Short-Term Accident’ theory. But both approaches have misunderstood the shape of history. Ian Morris presents a startling new theory. He explains with flair and authority why the paths of development differed in the East and West and – analysing a vicious twist in trajectories just ahead of us – predicts when the West’s lead will come to an end. How did the idea for the book initially come to you? Like many people living on the west coast in the US, I was struck by the number of people now living there and how much life there is intertwined with life in Asia. I grew up in England and this exposure to Asia was very new for me. It got me thinking about what I learnt many years ago as a student which was basically the assumption that there was something unique about the Greek and Roman worlds which in turn created an equally unique western world which shaped everything on the planet. Seeing what is happening in East Asia I asked myself “Is this really true?”. That was what led me to start looking into the subject and I realised that the traditional historical picture did not really fit the bill at all. I imagine you surprised many readers by starting your book many millions of years ago in the Ice Age? The basic assumption behind trying to write a book like this is that you are able to identify the big patterns of history and once you have done so you can project them forward and see where they take you. It has to be done on a fairly global scale and over a long period of time. Most historians go white as a sheet if you tell them you have identified patterns that define history. Historians tend to specialise in very small areas or topics but you can’t see what is really going on when you operate like that. When you look at a very detailed map you can’t make out the larger landscape. You need to back up from the detail, in this case 15,000 years. Were you too limited by the 2,000 years of documented history that historians traditionally deal with? Having that traditional background as a historian is very useful and you can tell when a historian has that background but it is important not to let that traditional approach dictate what counts as evidence. Yes, they were the real pioneers of this idea of not caring what label you put on the discipline but more importantly “can it help you to answer your questions?”. This is well established in archaeology as well, you just draw on whatever discipline appears to be relevant. Teaching at a big research university helps as well. You can just drop in on someone from the Biology department and try out your ideas on them and see if they say you are insane or not! Geography and social development are very important in your historical view and they appear to have a push-me pull-you relationship. Yes, but this is something that I only worked out in the course of writing the book. When I started out I was not putting quite such a strong emphasis on geography but by the time I had written chapter 12, the penny dropped as at every critical point in history, I kept saying that it was geography that was driving things. I must have terrified my editors by announcing that I was going to start the book again! You suggest that the West “rules” as it had a head start over the East right from the primitive beginnings of mankind. As I was writing the book, the big dynamic became the interplay between geography and social development. If the world were a simpler place then with the West having a 2,000 year head start that probably would have been the end of the story but the story is not so simple. What I had not thought of before was the way in which rising levels of social development in much bigger societies that reach out across the world, meant that the story becomes increasingly inter-connected, which is what sets off these moments of dramatic change. You suggest that the similarities between East and West outweigh the differences, suggesting that human beings are the same everywhere. Absolutely. There are of course differences but the differences are mostly superficial. Some of my friends have said that the book is not about East and West but is about me and I tend to think that everything is very much the same, but there are some people who prefer to highlight the differences between things so that may be what is really going on here. You identify some crucial moments in world history such as 1200 BC and 541 BC when the West imploded and the East caught up. What happened exactly? The crucial moments are when you get a collapse in one area, or moments that trigger “threshold events”, which are moments that are much easier to see in more recent history, as now just one lifespan can witness profound changes such as in the 19th century with the Industrial Revolution, in earlier periods, these “breaks” tended to be slower and more drawn out. In 1200 BC when you see a collapse in the western core, it takes about a century or more to play out fully. The collapse of the Roman Empire took two or three centuries to complete. A very important part of your book is the use of an index of social development, which is partly based on a UN index, is that correct? This is one of the ideas that got me started writing the book, I wanted to create something like this index which would allow me to compare different countries and regions. This is the part of the book that will no doubt receive the most criticism from other academics although so far they have been pretty polite. But I doubt that this will last! Previously it was very fashionable to create indices like this back in the 19th century when it made more sense as at the time we simply did not know much about different parts of the world. By the early 20th century, it was becoming obvious that we really did not know enough to build these indices and by the middle of the century people started to back away from this methodology. Now however, we have enough information to try doing this sort of thing again. The experience of the 20th century served us very well as it uncovered many of the problems that we can now fix. We can now do this in a more sophisticated way. Even if people say that my index is riddled with errors and conceptually unsound, which I am sure it is, it will at least be the first step in trying to convince people to do a better job. Perhaps in thirty years time we will have an index that most people can agree on. When you talk about the West “ruling” are you talking about military power and industrial output? 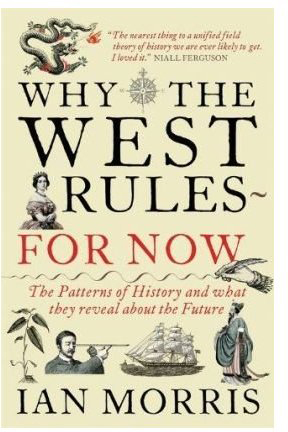 I was a bit nervous about calling the book “Why the West Rules”, I would have actually preferred something much less catchy like “Why the West has exercised a historically unprecedented dominance” or something like that but that might not have worked. The way I think of it is Europe and North America between them account for about one seventh of the world’s population but they account for two thirds of the world’s GDP and more than two thirds of it research and development spending much of which is going towards the construction of nuclear weapons and aircraft carriers and the like. Fifty years ago the imbalance was even more extreme. There is a huge imbalance of wealth and power in the hands of a small part of the world’s population. Is it actually possible to use an index of social development without passing judgement, are you not necessarily implying that eastern culture has for the majority of history been inferior? Is it possible to remain neutral? Yes I think it is possible but it is also quite difficult. You have to constantly remind yourself that this is just one measure, it is certainly not measuring how happy people are. What it really does is measure how successful societies are in competing with other societies and in increasing their material well-being but some people will say that this is a “good” versus “bad” index but many others would not say that but I would like to think that you can use this as a value neutral tool. If you think blowing people up is a good thing then clearly the index is a measure of goodness and if you think polluting the world is a bad thing then you could see this as a negative measure. I think it is possible to separate it from moral evaluation, but admittedly it is difficult. Economics is conspicuous by its absence in your historical model? Why is that? At the beginning of the book I suggest there are three things you need to know about to answer the question “Why the West Rules”, biology, sociology and geography and I use these terms in a very loose sense, (something that my academic colleagues find a bit horrifying! ), when I talk about sociology I mean a broad swathe of the social sciences. There is quite a bit of economics in the book, I think sometimes economic historians are a little too eager to put economics in the driving seat. Economists in Europe and North America have this tendency. They are a little too keen to think that the shift towards market institutions and a liberal society is the driving force of history as if the whole of history has been either the run up to the development of these institutions as was the case in 17th and 18th century Europe, or the playing out if this economic breakthrough. If you look at history in this way then large parts of history become very difficult to understand and explain and often the argument of some of the more dyed-in-the-wool neo-classical economists, always ask themselves why it takes so very long for humans to develop market economies. If you take a broader look at history you see that countries tend to develop institutions that are successful within that specific national or regional context. Early economies tended to very centralized with instructions going out to remoter regions telling them what they should be growing. One would be growing wheat, another region rearing sheep and eventually all the produce would be accumulated at the centre and redistributed. This for a classical economist is pure insanity. Exactly. It was very inefficient way to organise things but for a few thousand years this was the way most of the successful societies of the world operated. This worked for those societies. The level of trust and organisation and the infrastructure you need for a market economy to work was simply not there. A market economy would simply not have worked. Later, when you see these new kinds of economy developing around the edges of the Atlantic Ocean, you very quickly see the liberal institutions come into being as they can thrive in that environment. In the 17th century the English and the Dutch moved ahead of France and Spain because they already had somewhat more liberal and open societies. One of the big questions for today was whether the shift towards more liberal economic institutions in the 17th and 18th century is a permanent part of the super wealthy market economies or if we will see in the 21st century, a very different type of economy like the one we currently see in the People’s Republic of China which may flourish without this type of open society. Yes, some “big picture” historians would like to say that there is basically no such thing as free will. Engels was the famous one. He would say that history required Napoleon so Napoleon was brought forth but if Napoleon Bonaparte had suddenly drowned, history would simply have brought forth another Napoleon. This is clearly ridiculous, certainly at that level of determinism. Clearly we do have free will, we make choices and the choices we make have an enormous impact on our lives. Having said that, the kind of choices we are faced with do not relate to the kind of questions I am dealing with in the book. It is very hard to find characters (until the advent of nuclear weapons) whose decisions have global implications but in the case of someone like Muhammad for example this is the perfect example of small personal decisions having a massive global effect but with or without him the overall pattern of history might still have remained the same certainly for our East\West discussion. You also say that social development carried the seeds of its own destruction. It is not a seamless progression. As societies develop they have unpredictable “externalities”, things happen that nobody foresaw, this is something that we see happening over and over again throughout history. The Roman Empire is a classic example, who would have thought that the growth of these super successful empires in Eurasia would feed the development of a society out in the steppes, which would set off migrations and spread disease to such an extent that the Roman Empire could not cope. Even in our own day, if you look back at the beginning of the 19th century with the advent of the Industrial Revolution nobody could have predicted that 200 years later we would be trying to deal with the results of this revolution with its effect on the global climate. Yes, but so far we have not seen any ceilings that are so hard that they could not be broken through. But what we don’t know is whether or not there is a hard ceiling hovering over us as we speak. A lot of the big problems we are currently facing are the problems faced by the Roman Empire and in Eurasia in the 14th century. Massive uncontrollable migrations, collapsing states, famine and epidemics and climate change too. It is not clear yet if these forces are actually destroying us so it may be that some of these issues do not become major challenges in the 21st century. People suggest that massive migration may become so massive that societies just simply cannot cope. There are two big lessons to be learned from history: identifying the major trends and then projecting them forward which is one of the things I do at the end of the book. In a very linear way I note that if social development in the East and West continues on its current path we will see their “index scores” crossing at 2103, (ridiculously precise!). The second lesson we learn is that it is very difficult to project any trends forward for any length of time as social development has a way of undermining itself as I mentioned earlier. So you have to ask how this soaring social development and the these undermining forces will react together in the 21st century? You intimate that perhaps the East-West question will simply dissolve as Asia merely westernises and becomes part of the west. This is true, you have to remember that hundreds of years ago a question of the East or West ruling would not have made any sense at all. I think we are moving towards a world where this type of question will make less and less sense. I end up suggesting that there are two main paths that we have to choose from: one is where social development does continue soaring up to the top of the index, if that is the case we will be seeing social transformations that will beggar our imagination. If we do go this way then the old geographical issues will become irrelevant. The second choice is a total social collapse which will be unlike the other collapses that the world has seen as this time we have nuclear weapons playing a part. Something very destructive could take place 40 years down the line. We are more than capable of wiping ourselves out entirely. Ironically, by writing a book about the East-West question it made it clear to me that the real issue was not the answer to that question but just how much our world is about to change.